American Heart Association raised their prices for all U.S. training centers on October 3rd, 2017. The substantial increase in prices for the Heart saver Certification Cards for every HeartSaver card is $20 per card for the ERTSS instructors. The price increase affected prices of the course at LJB Security, but a ceritfication in this course has a lot of value with any security job. CPR classes went up $25 due to this. There was a price decrease in the textbook from the AHA Vendors required for this course – which went down to $2.50 (plus shipping & tax). **The ERTSS may have Heartsaver textbooks for $5.00 to pick up at ERTSS (Call first to check availability). For the American Heart Association price update click here. For the Heartcode blended Heartcode course, a textbook is not requrired and the card is $20. 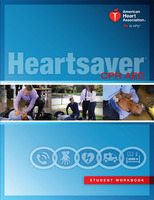 AHA raised their rates so for our CPR course and package deals for training, we are now bundling their book with our courses. This is a great value for anyone looking to gain their HeartSaver Certification! For great training packages for individuals, security companies and other organizations, call LJB!